Usually, in Winter, I'm all for warm and comforting bowls of oatmeal, fresh out of the oven breakfast bakes and I cannot handle anything cold whatsoever. Right now, however, I'm the total opposite. My obsession with breakfast bakes continues and this baked oatmeal just got added to the list! Best of all, it's delicious hot or cold. 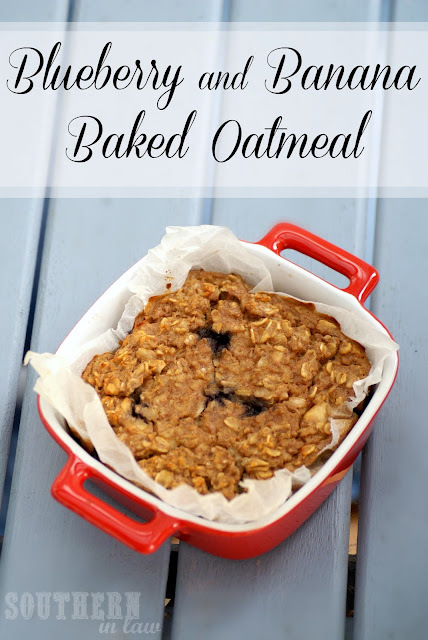 One afternoon I whipped up these baked oatmeals for a warm and comforting breakfast the next day. I popped them into the fridge over night and when the next morning arrived, I totally didn't want anything warm. Still wanting to try my new creation, I dug my spoon in and ate it anyway - and holy moley was it good! In the past, I'd never eaten baked oatmeal cold - but now I don't know if I want to eat it hot again! The blueberries on the bottom of this baked oatmeal were soft and juicy and it tasted like I was eating some sort of blueberry pie. Just to make sure it was good hot, I also made this yesterday and ate it fresh out of the oven - and it was delicious! (Though right now my cold breakfast obsession continues) So this recipe is totally a win win - whether you're in cold Australia or trying to cool off in the Northern Hemisphere! In a bowl, mix together all ingredients except for the blueberries. Leave your oat mix to sit and absorb some of the liquid. Whilst your oat mix is softening, prepare a medium baking dish or four individual ramekins/baking dish by greasing and/or lining the dishes. Lay your blueberries into the bottom of the pan(s) and pour your oat mixture on top. 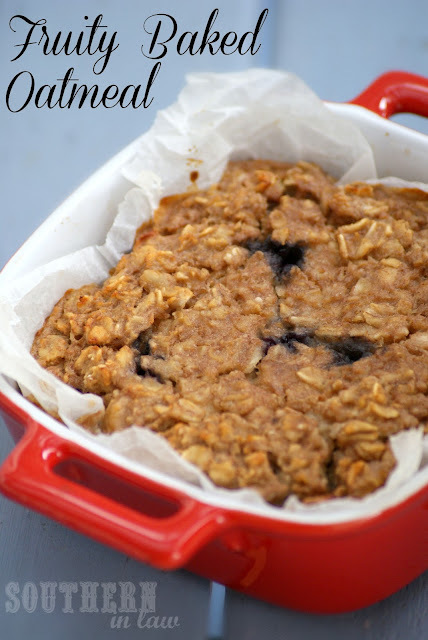 Bake for 30-50 minutes or until the tops are golden and the baked oatmeal has firmed up. These baked oatmeals also freeze really well. Simply allow them to cool completely before wrapping them up and placing into the freezer. I find it's easier to keep them in the baking paper so you don't lose all of the juicy blueberries. *Note: If you are gluten intolerant or a coeliac, make sure you buy gluten free oats which have not been contaminated by gluten. Do know that oats do contain "oat gluten" avenin (which is why you cannot find gluten free oats in Australia) which only 1 in 5 coeliacs is allergic to. I am a very sensitive coeliac and have no issues with oat gluten. I buy Bob's Red Mill Gluten Free Oats from iHerb are also uncontaminated. **If you don't like banana: you could probably switch the banana for pumpkin/applesauce/sweet potato puree If you don't like blueberries: swap them for any berry of your choice, or a diced apple. But tell me, what's your favourite breakfast right now? do you think there would be something i could use instead of oatmeal? oats are not welcome in this house! plays havoc on asthma!! Hey Penny, you could try using quinoa flakes or rice flakes - you'd just have a different flavour (and a slightly different texture if using rice flakes). Also, if you can have any other type of rolled grain - such as rye, barley, spelt etc that would work too. oo i have quinoa flakes at home. been sitting there for nearly a week. picked them up at health food store and ive been putting them on yoghurt in the morning but thats all my imagination could come up with! i am loving all your ideas on here. and am yet to go through all the recipes! there are so many i have on my "list"!! You are too sweet, Penny! I sometimes find Quinoa Flakes a little bitter - so you may want to add just a little bit of honey or maple syrup as they don't have the same natural sweetness as oats. Have you tried using just water instead of the almond milk? Hi Valerie, I haven't - but you could. The only problem is, water tends to absorb more than almond milk/regular milk so you tend to end up with a dryer baked oatmeal and don't get that delicious creaminess.